Most of our productivity apps in the Google Playstore offer essential note-taking and task monitoring activities. However, in our busy schedules, we need something more than just a plain journal and activity recorder. This is where WhenDidI steals an ample amount of spotlight among the different productivity apps in the Android ecosystem. WhenDidI offers you cool experience in taking in control of your daily activities. This app is flexible enough to do all your productivity ventures. It could track anything – from your calorie intake to the cash that you’ve spent in a day. When others keep on jumping from one specific app to the other, you can do almost all of your productivity activities in just one app. The app is very minimalist. It comes with a very Metro-like Holo Interface. I could easily get through the app eventhough I’m just a new user. Yes, navigating inside the app is just a ball in the park. The user interface is also engaging and it gets things done with only few sessions with the app. Keeping track of different things is way too easy using this app. 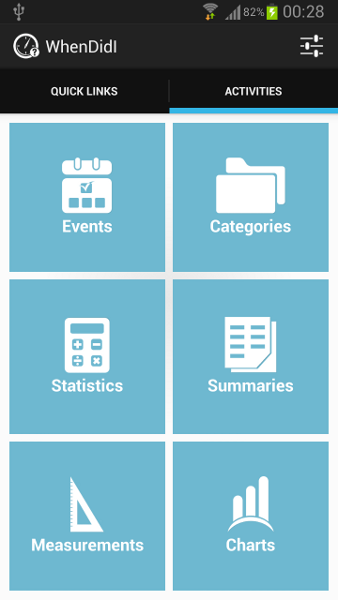 There’s more to being productive in using this smartphone tool - categorize your events into different perspective, gather statistics, summarize information in each category, measure data and do a graphical presentation. A feature called Quick Links is one of my personal favorite. It allows you to “bookmark” functions that you often use. Trial version allows you to enter only 31 events. And if you feel the need to get a bulk of unlimited events, you could always opt for a full version. You can also backup your events in your SD card or Dropbox. The app also has a sharing function through email. WhenDidI is a fulfilling app. The simplicity of the app does not limit its capacity to deliver results. If you are a busy worker and needed something to keep track of your daily routines, WhenDidI will be a better day-to-day companion.